Executives from the top four major U.S. carriers are meeting today with President Trump. Among the topics scheduled to be discussed are the future of drones and 5G technologies. 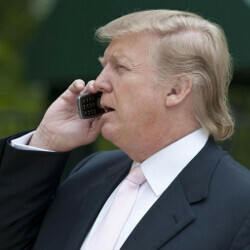 With 5G expected to be available to U.S. consumers by no later than 2020, the president is expected to hear about its future from executives who toil at Verizon, AT&T, T-Mobile and Sprint. No doubt Mr. Trump will be happy to hear that his Tweets will post 10 to 100 times faster than his current messages do over 4G LTE networks. And if the president is interested, he might find it fascinating to hear about virtual surgery conducted with 5G connectivity, or how 5G will be able to wirelessly connect consumers with smart appliances like thermostats. Some of the new uses for mobile devices once 5G launches, will require government approval. It would behoove the president to be prepared so that he could start doing some serious thinking about putting an infrastructure in place that will help the government understand 5G better. AT&T CEO Randall Stephenson and Sprint CEO Marcelo Claure will be among the executives updating Trump on the future of wireless service in the U.S.
As for drones, the FAA earlier this year predicted that the hobbyist fleet will triple by 2021, while the number of commercial drones will rise by a factor of ten to 442,000. The Trump administration will have to decide whether to allow companies like Amazon deliver packages using drones. The drones would be flying outside of the sight of an operator, which might be worrisome to the FCC. On the other hand, allowing retailers to deliver purchased goods by drone could give the economy a real shot in the arm. If they don't drop his name every 10 words, he won't pay attention. He thrives off hearing his name, and he will start day-dreaming if no one mentions him. He's someone that has to be the centre of the universe to everyone else. I feel sorry for the guys who need to explain technology to this moron. It'll be like trying to teach a pet rock to fetch. Why is it up to the Trump Administration to allow drone usage? Not the Senate or whatever. They'd better bring 3rd grade level picture books for him. Not that it matters, all they need to do is flatter him and tell him Obama wanted to do something, and he'll immediately give them the opposite. Anything or anyone is better then libtards, no matter if trump or ANYONE else.